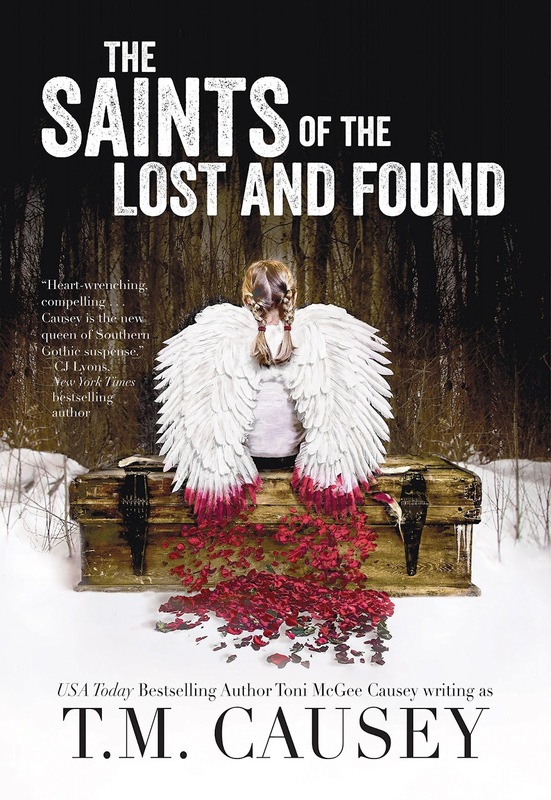 I recently received an advanced reader copy of The Saints of the Lost and Found by T.M. Causey. I picked it up late one afternoon, thinking I'd read the first chapter and get a feel for what it's all about. I turned the final page at 1:46 AM the next morning and have now added a new book to my keeper shelf. Wow, what a story! It grabbed me from the first page and would not let me set it aside. I missed dinner, the dog's evening walk, the college basketball game I had planned to watch and my bedtime. This story - and these characters - absolutely refused to turn me loose. Causey pulled me through an emotional wringer; I didn't just read about Avery's story, I lived it with her. And, though the journey was at times heart-wrenching and horrific, the end brought a smile of hope to my heart. If you enjoy dark, Southern Gothic suspense with complex characters, enough twists and turns to keep you guessing until the very end, and a touch of paranormal realism, then you'll want to lose yourself in T.M. Causey's The Saints of the Lost and Found. I have a feeling that it will be quite some time before I'm able to stop thinking about it. Please enjoy the following Q&A with T.M. Causey (a/k/a Toni McGee Causey) and leave a comment for a chance to win a signed copy of the book. Q. Before writing THE SAINTS OF LOST AND FOUND, you wrote a very different kind of book under the name Toni McGee Causey. Tell us about those books. A. A long time ago, I wrote a comedic thriller /caper trilogy about a crazy southern-fried heroine, Bobbie Faye Sumrall, who took no prisoners and pretty much would destroy everything in her way if she was trying to get to someone she loved to help them out. She was an absolute hoot to write -- smart, but vulnerable, smartass, but kind-hearted, and the kind of woman who'd looked for love in all the wrong places and had blown up a few of them afterward. I loved her so, and she'd make me wake up at night, laughing, when I had apparently dreamed the next scrape she was about to get into. I wanted to write a female super-action figure type of person, someone who had her own sort of negative mythology to live down, who was just trying to go about her day and survive and keep people she loved alive, and to do it by her wits and strength and tenacity. It amused me when one reviewer early on thought she was a “Mary Sue” – someone who can do everything and do it perfectly. (Which told me he didn’t read the book, because she pretty much screws up from page one.) It also amused me when a few readers felt she wasn’t realistic, because I hadn’t expected anyone to really believe that there was this woman running around, blowing up half of the state. What thrilled me was how so many people embraced the Crazy and laughed and told me they’ve re-read her many times, because there’s a deep story buried in her life. There’s a lot of pathos. If you don’t have hardships and tragedy beneath the comedy, then it’s just slapstick and meaningless, (to me, at least), so I knew her life had been rough, she’d been in some really tight spots financially trying to take care of her brother and sister, and she was still struggling just to make ends meet. Q. Your just-released Southern Gothic contemporary mystery/suspense novel is quite a departure from those early books. Why the change in direction? A. One of the odd surprises of my life is that the thing you never expect to hit is the thing that hits, and in so many ways, that's what happened with Bobbie Faye. She was fierce and fun and I loved giving my humor a wide field in which to play, from subtle to sarcasm, from irony to near. I always saw Bobbie Faye ​as Wile-E-Coyote just as he goes over the edge of the cliff, looking back at the camera with that oh, crap! expression, and it was a joy to write her. The great thing about being a writer is that you have so many stories you want to tell. The terrible thing is that you have so many stories you want to tell. I was never very good at writing what I was "supposed" to write next. There was a sort of fallow period immediately after the trilogy where I tried several different stories and... they sucked. Massively. They didn't make it past the first act because I shuddered and deleted them, never ever ever to be seen again, thank goodness. Mostly they sucked because I was trying so hard at that time to write what I thought I was supposed to write next, to fit in with the market, to sell, to keep making the fans of the writing happy (or, at the very least, not disappointed), and I can tell you, there are brilliant writers out there who are genius at this, and their storytelling / quality of writing does not suffer. Unfortunately, I was not one of them. So after the suckage-fest, I finally faced facts: I needed to write something that inspired me, that I knew I wanted to dig into, and I'd had this idea for a long time about a woman who finds lost things, and what would that be like? Oddly, at first, I thought it was going to be a funny novel. But Avery showed up almost simultaneously with the idea, and every time I tried to "write funny," it went flat. And the more I looked at her, the more I delved into who she was, and how she got that way, there was so much pain, so much darkness, and quite honestly? I was scared of it. I think I quit writing this book more than a dozen times. I was on a writing retreat at the esteemed Joan Johnston's house, with Peggy Webb and my dear friend, CJ Lyons, and we did a ton of brainstorming for each other’s works in progress, of untangling confused story-lines or suggesting twists and turns. I'd never participated in something like that before, and still, I was terrified of writing this story. There was more fear than just the "what if I fail?" thing that plagues nearly every writer. There was the bone deep realization that there were some truths I was going to have to tell, some things I was going to have to mentally live through that were hard, and I had to face the fact that I would feel exposed for the first time, really, as a writer. I don't think you can tell as dark a story as SAINTS is without that sort of vulnerability. At least, I can't. There was a point in the retreat when the ending (a critical piece of it) came to me, and I stood there in tears, because I knew that the journey there was going to be so hard for Avery, and so necessary, and while there was some hope in that ending, it was not going to be easy. I almost quit the story right then, and Peggy Webb found me in the kitchen in tears and sat me down to listen to the story again. When I had gone through the truths I knew I would have to delve into, she said, "You have to write this. You're meant to write this. You can do this. I believe in you." Q. THE SAINTS OF THE LOST AND FOUND is genre bending. How do you define the genre for this fantastic book? A. Well, first, thank you for the compliment. I started calling it a southern gothic mystery/suspense more out of a warning to my past readers that this was absolutely not humor, as my previous books had been. I would much rather not make a sale than to have a reader buy the book because they did not understand what they were getting and then come away shocked or disappointed. I hope the darkness and subject of the cover, the description, even the title, gives a clear idea of the tone and mood and type of book this will be. Q. Mystery, thriller and suspense fans will no doubt love THE SAINTS OF THE LOST AND FOUND, but what’s in it for romance readers? A. First and foremost, SAINTS is not a romance. There are ramifications—terrible ones, bittersweet ones—for the love of Avery’s life, and for her and for the choices they made, which is crystal clear at the beginning of the story. I feel it’s important for romance readers to know that there is a story about love deep in the bones of SAINTS. It’s just not an easy one, and there are obstacles—serious, deadly obstacles—that Avery will have to navigate just to survive. If she can survive. And I’m not being disingenuous about that—I want romance readers to know that the kind of love story that’s a part of the very marrow of this story is a brutal one, but I think, it’s also a love story that will resonate. Q. SAINTS has a fantastic paranormal element in which Avery Broussard, the heroine, “sees” people’s losses. In fact, she comes from a family gifted with unique abilities. What inspired you to gift your characters with these abilities? A. My dad told me a story once a long time ago that stuck with me, and I think the seeds were planted way back then. He and my Paw Paw had been hunting. My dad’s family was very poor, and if they didn’t hunt, they didn’t eat. This was back in the days of the Great Depression, and my Paw Paw’s three hunting dogs were prized because they ensured successful hunts. “You lost a dog a ways back,” the old man said by way of intro, and Dad said his hair stood straight up on his head. “Yep,” Paw Paw said, but didn’t elaborate as the old man turned his head and sort of stared out into the trees. Paw Paw thanked him, promised him some food from the hunt, and he and Dad climbed back in the truck, heading the almost hour drive back to where they’d been hunting. My dad’s not the kind of person who believes in woo-woo stuff, especially something like this, so he indicated he thought it was all a waste of time, but they found the fork in the river, veered to the right, and about a mile from the fork, the dog was hung up in the barbwire fence. I probably would have dismissed the entire thing as completely far-fetched, except that it was my dad telling the story, he was sincere in his disbelief-until-he-saw-the-proof aspect, and I’d had enough oddball experiences finding things that other people had lost that I knew there could potentially be more at work than someone simply telling a tall tale. For many years, I’d get flashes of where something was that I was looking for... I’d “see” it, and then sure enough, that’s where it was. I’d never thought much about it other than assuming I had simply probably memorized its location as I walked through a room—maybe something akin to a photographic memory—but I never assumed it was anything short of just memory, until one day, a friend was telling about her mother’s lost high-heeled red stiletto shoe, and I “saw” it underneath her porch. She lives in Nova Scotia, and I didn’t know that. I’d never seen the house (not a photo, nothing), didn’t know anything about its architecture, and yet, I saw the shoe. The shoe was exactly where I saw it, in that same condition. That weirded me out. Plenty. So, I told a couple of people, and the first thing they did was ask me about something they’d lost. I was almost always wrong about my guesses. I think my ratio of correct “images” to questions was so low, it probably needed multiple zeroes after a decimal point. I didn’t mind being constantly wrong. It was a relief, actually, because the hope that people have when they are asking that question is unrelenting, and dashing those hopes, or seeing their disappointment, was equally brutal. Years later, Avery was born, and I think she’d probably been there all along, from the first time I found something... or maybe even as far back as when my dad told me that story. Because I always wondered, “What if?” What if something like that was real... and consistent, and you really could find things? What would you do? How would you use it? Would you help the police? With what? Big things? Children? All the missing children in the whole world? And what if you got it wrong? Thank you to T.M. Causey and Nancy Berland Public Relations for today's Q&A. What about you, readers? Have you ever had the experience of finding something you shouldn't have been able to? Have you done it more than once? 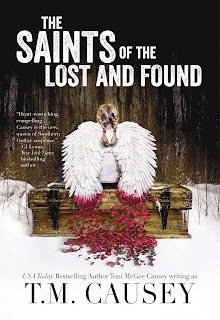 One person who leaves a comment on today's post will receive an autographed copy of The Saints of the Lost and Found. Deadline for the giveaway is 11:00 pm (EST) Thursday, March 10th. No, I cannot say that I have. Sounds like an interesting tale. It's a fascinating book, Karen. One I highly recommend. I do find mementoes and meaningful items which have been lost for a long time. This novel sounds fascinating and intriguing. When someone asks me where something is I can pinpoint the exact place to locate it, even if it is in an obscure hiding place. As far as "seeing things", which was a program in Canada years ago and was unique, I cannot do that although I do have premonitions and feelings about things. What an enthralling book which interests me greatly. I enjoyed the lovely interview and Paw Paw's adventure very much. The author is talented and creative. Thanks for this great feature. I started reading this book last night, and am loving it. Can't wait to finish! Thanks for the post. Actually, I have. Today, when I was clearing out a bureau, I found a tub of my Mum's favorite Talcum powder that she used to use. It's called Tweed, and I've had it ever since she passed away 37 years ago. I actually sprinkled some on to the palm of my hand, and the smell (yes it still had its smell) immediately reminded me of my Mum. I loved your review, and it seems like this would be a fabulous read. I love how certain smells can conjure memories of certain people and times in our lives. I have done that with jewelry. I had one ring my husband had given that I lost for years and then found it in our car. Then many years later I lost it again. I felt so bad my husband got me another ring. And I found it again months later in the laundry room. Unfortunately many years after that I lost it for the 3rd time outside and haven't found it yet years later. I guess 3 times was not lucky for me but I still have hope lol. I hope you do find it! THE SAINTS OF THE LOST AND FOUND sounds like an excellent read. I will be looking for it. As for finding things, it hasn't really happened in the sense you are describing. It is more along the lines of things meant to be. A friend and I both liked antiques. She had a lovely English wash bowl and pitcher set that included a covered soap dish, a tumbler type piece, and a second covered dish (perhaps for hairpins). While visiting her shop, I noticed she had it in the window. She said she wasn't selling it, it was just for display. Shortly afterwards someone asked to buy it, but they were still shopping around town. My friend agreed. A bit upset, I said I had asked first and if she wanted to sell it I wanted to buy it. She agreed and we packed it up. Shortly afterwards, we went out to shop the vendors who were in town for the festival. At one booth, I found a 6 piece dresser set that matched the wash bowl set and bought it. When we got back to the store, someone came in with a shoebox. Inside were a pair of candle holders that matched the set. They had noticed the washbowl in the window and brought them in to sell. I bought those too. My friend just shook her head. She had owned the wash bowl and pitcher set for over 30 years and had been looking for pieces to match the entire time and never found any. Yet within an hour of selling it to me, we found these other matching pieces. My friend said I was obviously meant to have it. I agree with your friend. Those other pieces were just waiting until the rightful owner had claimed the missing piece. I do believe that some things are meant to be. When I lose something it tends to stay lost. Love your review and will definitely check it out. Sounds suspenseful and I'm intrigued. Hope you give the book a try, Carol! After seven kids, your mind is probably going in too many different directions to focus on one missing item. We were redoing our kitchen a few years ago and I had moved all of the contents of the drawers and cabinets into boxes and put them in the vacant bedrooms of our kids who were in colleges and away at the time. When it came time to put things back, I was missing a ceremonial wine goblet that was a family piece given to my husband and me at our wedding. I was sick about it. I called Goodwill where I had made a lot of donations trying to simplify what I had in the kitchen, I searched through the house, all to no avail. I put things back in drawers and in cabinets and kept looking. I felt horrible about its loss, and every Friday night when my husband would recite the blessing over the Sabbath wine, I felt the goblet's loss even more keenly. During Rosh Hashanah, the Jewish New Year holiday, which was nearly half a year after the goblet had gone missing, I was reaching in a cabinet over my desk to pull out a serving bowl I would be needing that night when I felt something rolling inside the needed bowl. It was the silver goblet. I don't know how it got there, because I wouldn't have put it there, it belonged in another cabinet at the other end of the room. When I wonderingly pulled it from its resting place in the serving piece, I noted something strange. In the bottom of the cup portion of the goblet was a desiccated sticky substance. Not wine, oddly enough, but honey. Honey at Jewish New Year's is a symbol for a "sweet" and happy year ahead. I, certainly, wouldn't have put away a dirty goblet, and I had no reason to pour honey in a goblet meant for wine! This made absolutely no sense to me. It's a mystery that has never been solved. Wow, what a story, Laurel. I got chills. I usually find lost things where I left them... not a gift, just common sense. I realize this is different than what is in the story. Huge fan of TMC and looking forward to reading this story! Have heard so many wonderful things about this story. It's very different from what she's written in the past, Denise but it's a powerful story and one I highly recommend. I've had a knack for finding and "knowing" things for most of my life. It's not consistent and sometimes happens when I least expect it but I've learned over the years to pay attention to the feelings. Several years ago, I was standing on the sidewalk chatting with a friend in front of her store when we witnessed a hit and run accident. About 30 minutes later, I left to drive home but instead of turning toward my house I continued driving to Walmart (there was nothing I needed there) where I bypassed the aisle where I always parked. Driving down a different aisle, I drove past three open spaces and pulled into the fourth...bumper to bumper with the car that had caused the hit and run accident I had witnessed. I called the police and the driver was arrested when she came back to her car. I have no idea how I knew that car was there. I just knew something was compelling me to drive there. As I said, I've learned to listen. PJ, I think your story is very compelling. You have a sense, or intuition --whatever you'd like to call this, that you should never ignore. In this story, that was a gift to the victim of the accident who might have had trouble getting medical help or trouble with her own insurance company if you had not "listened" to the message to go to WalMart and seek out a different parking spot! This is an amazing story. I don't think I have ever found something that I shouldn't have.